Will additive manufacturing powder processes become obsolete? Fedor Antonov is chief executive officer (CEO) of Russian additive manufacturing (AM) firm Anisoprint, a resident of the Skolkovo Foundation's nuclear and new industrial technologies cluster. In this article for Disruptive magazine, he presents his vision for the future of the industrial AM industry, which focuses largely on composite materials rather than the current favorite: metals. 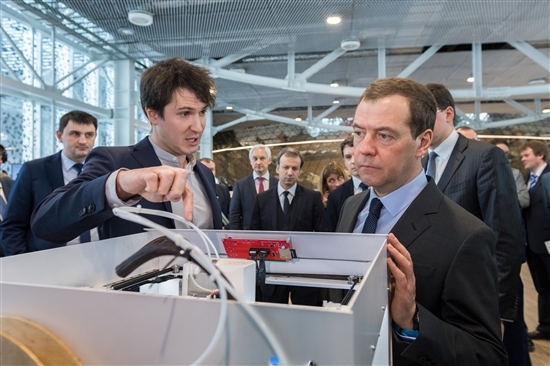 Fedor Antonov (left) demonstrates Anisoprint's technology to Russian Prime Minister Dmitry Medvedev at the Skolkovo Technopark earlier this year. Photo: Sk.ru. As the 3D printing industry has evolved over the last three decades, two distinct communities have emerged with, I believe, only a small intersection. These different communities can be broadly identified as consumer and industrial, and within the latter community the term 3D printing is rarely used, with an obvious preference for the ‘additive manufacturing’ moniker. The differences between these two worlds can be debated at length, but this article will focus on the industrial AM sector. It is within this segment that the advanced additive processes are starting to radically change the way companies approach some production applications. Many promises have been made about AM technologies, not least: the ability to manufacture a new generation of functional, mechanical parts; improving design and certification approaches; and the transformation of the supply and added value chains. In parallel with the process hardware developments, new design techniques such as topological optimization are also evolving, enabling additive processes to fulfill the production of structures with an arbitrarily complex shape. In this article, I set out to address—and challenge—some of the widely-held views across the AM industry today, as well as future predictions for the direction AM technologies are heading as a universal production technique. Suffice to say, I am not disputing here the power of AM as a supporting technology for prototyping, manufacturing of models and master-models, tools and other auxiliary technological devices. Read the article in full here on DisruptiveMagazine.com.